Sometimes, small adjustments can make big differences. So can managers who are open to player input. Liverpool manager Jürgon Klopp is that sorta dude, so when Reds captain Jordan Henderson requested that he play further forward against Chelsea, Klopp figured it was something worth trying. The result was Henderson earned Man of the Match honors, covering terrain like a dervish and setting up the 'Pool's first goal in a 2-0 takedown of the Blues. Make no mistake, though. The Reds were tested in a tough clash against a side that had gone undefeated at Anfield since 2012. ... and on a somber note, the 30th anniversary of the tragic Hillsborough disaster that was ultimately one factor that caused the modernization of all English football grounds into all-seater stadiums. It was about time, too, for a move that was long overdue. Once the match got underway, Chelsea looked like a side vying for a Top Four finish and the lucrative Champions League berth that goes with it. They had their chances, but the 'Pool still dominated most of the action. Scoring threats in the first half were rare, though. Mohamed Salah had the best opportunity for the Reds, and Eden Hazard could have scored for the Blues but hit a post. It was one of three glorious opportunities that included César Azpilicueta sliding a gorgeous ball across the box and Gonzalo Higuaín let the moment pass when playing through on goal. A couple of those really should've been buried, which didn't exactly quell the uneasiness between manager Maurizio Sarri and Blues supporters. Indeed and verily. An outfit like Liverpool's only gonna give up so many clear paths, especially when they're at home. Furthermore, the second half seemed to be a game changer for the Reds. One quickly became two, as two minutes later, Salah took possession. 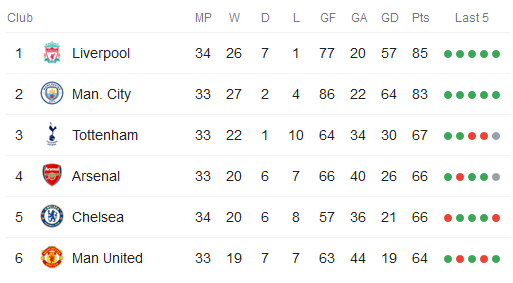 Chelsea, meanwhile, finishes the regular season with matches at home to Burnley, at Manchester United, home to Watford, and at Leicester City. It could be a tall order displacing Arsenal and/or Spurs. But there's always a backdoor qualification via the European League if they can hold off the Red Devils. Hope springs eternal, then, but dudes keep springing leaks.